They are so much a part of our lives today that it's sobering, if not frightening, to think that at the time of the last general election in the UK Facebook existed only as a small-scale social network for US college students, YouTube was still being tested ahead of public launch and Twitter hadn't even been invented. Welcome to the first UK elections in the social media age. Much will be made of how the national parties use (or abuse) these modern methods of communication to reach out to the electorate, in particular the many first-time voters, but how social media will be deployed at a local level is going to be even more interesting. When the worldwide web exploded into mainstream use in the late 1990s the real excitement surrounded its international capabilities. We are so used to it now that it's easy to forget the revolutionary thrill of instantaneous communication with friends, relatives or total strangers across the other side of the globe, the wonder of having news from far-flung continents appear on your desktop and the sheer exhilaration at being able to by a CD in America at half the cost of your High Street record store. Whilst we may still marvel at the power of the web to make the virtual world a much smaller place, the reality is that we don't live our lives globally - we live, work, shop, relax and socialise in a very defined local area. And so it came to pass that this worldwide communications tool is being used by a bloke in Worcester Park to blog about things that are happening in his tiny town, and thousands of others are logging on every week to read and comment about what's happening on their own street or at most just a few minutes' walk from their front door. It's not just me - all across London, there are countless other bloggers and citizen journalists tapping into the clear need for ultra-local content on the web. I was surprised last year at the level of online interest in the Nonsuch Ward by-election. Even though there was just a single Council seat being contested, the comments and visitor stats for the website showed a healthy interest in local politics online. As the very existence of the Worcester Park Blog shows, there is no shortage of local people going online to air their opinions on what is going in in their neighbourhood - planning issues, transport, the state of the High Street, problems with school places and so on and so forth. If used properly, blogs, Twitter, Facebook, YouTube and other forms of social media could prove a powerful platform for elected or prospective local Councillors not only to reach out to the electorate but also, and more importantly, to engage and interact with them in ways that no pre-election leafleting could ever hope to do. Quite how our current and prospective local politicians will take advantage of this remains to be seen - but already when it comes to Worcester Park politics there is a clear digital divide between the 'have nets' and the 'have nots' - witness, for example, the website from Worcester Park's prospective Liberal Democrat Councillor Jason J Hunter and his contact card resplendent with myriad ways of socially networking with him should you be so inclined. He is, unless I am mistaken, the only Worcester Park council candidate with an online presence you have to look to neighbouring towns (like Carshalton Central's Councillor Paul Scully) for examples of others. Simply having a social media presence isn't going to be the answer to a local politician's electoral dreams - it has to be used effectively, it has to speak directly to the local electorate, engage with them on a meaningful level and not just be used as yet another platform from which to harangue and already cynical and campaign-weary public. 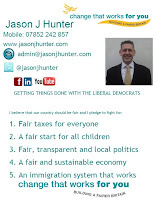 Full marks to Jason J Hunter for establishing an online presence and for engaging with bloggers like myself and The Brinkster in a bid to promote his campaign and spread the message to the local people. 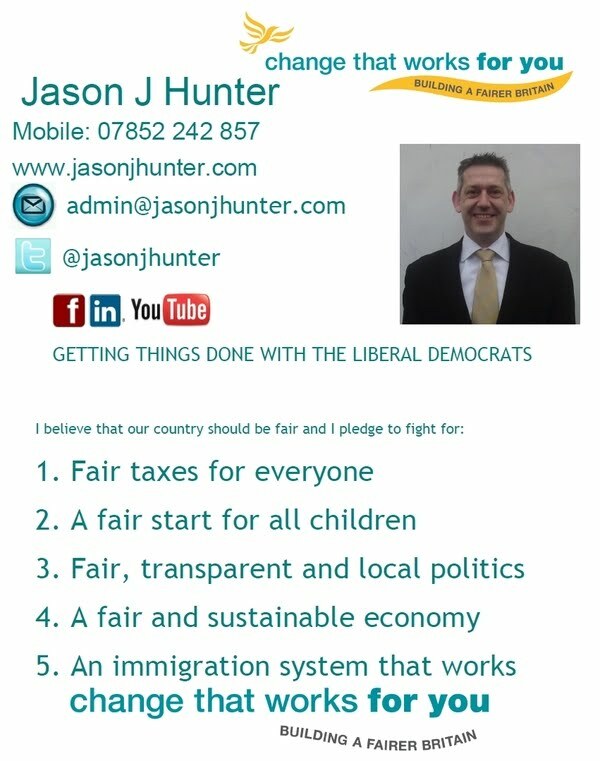 As for whether his website, blog, Facebook and Twitter pages will really strike a chord with the people of Worcester Park I remain unconvinced - mainly because they are filled more with inconsequential snipes at Labour and the Tories rather than meaningful pledges on what he would do for Worcester Park. Used properly, social media in this election campaign could give our savvy online politicians the edge over those who are yet to take their message online - and with potentially low turn out expected coupled with projected tight margins expected at Council and constituency levels there is real potential for an online presence to make a difference to the electoral outcome. Used badly, it is a disaster waiting to happen. I await the first electoral electronic gaffe - it's only a matter of time. When it comes to local politics in KT4 you can of course expect full coverage and comment right here on the Worcester Park Blog.